Since the fall of France in May 1940, the Allies had set their sights on avenging Nazi transgression. Four years later, preparation for D-day, the invasion of Normandy, was complete. More than 100,000 soldiers were to land on the first day. Nearly 12,000 aircraft and 5,000 warships would bomb and shell the beaches and ferry men and material ashore. Ike’s biggest worry was the weather. High wind, thick cloud, and heavy seas would swamp the invasion more thoroughly than anything the Germans might throw at it. And racing across the North Atlantic were a suite of storms which could do just that. It was up to one man, James Martin Stagg, SHAEF’s chief meteorologist, to tell Ike when the storms would arrive. If he got the forecast wrong, D-day would fail. 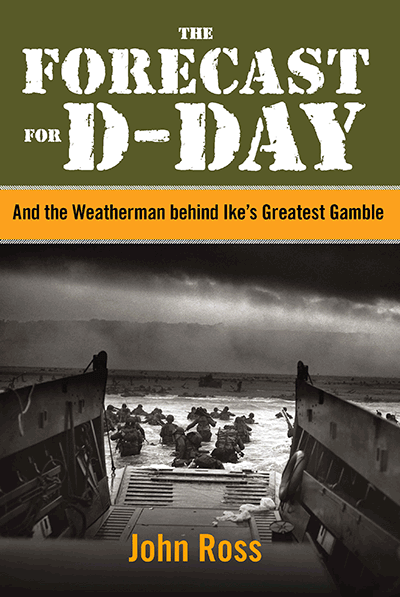 USAToday.com June 4, 2014 on D-Day: The most important weather forecast in history.